I had to chant: beagle hunt bunnies- and bunnies poop… to avoid stuffing this guy into my bag and bringing him home… soooo cute. If there is a theme around here, it’s WHILE. While I Wait. While I Work, and In a While…. (sidenote- if you type “while” enough it starts to look like you spelled it wrong:). 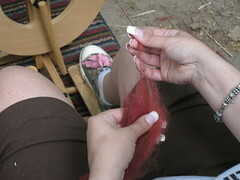 While I wait: I am spinning. I decided I could use my go-knits pouch (from the Loopy Ewe) to hold my fiber in process- it works GREAT! 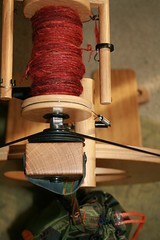 and snaps right to my wheel for outside spinning and travel and keeping the pets out of the fiber! Yesterday the boys spent an hour shelling peanuts, then we made homemade peanut butter! It was great! pulse in food processor until peanut- buttery! store in fridge. Later this week we’ll be experimenting with peanut butter cups:) YUM. The sock blocker is from the loopy ewe– just in case anyone is curious:) The yarn is Lorna’s Laces Shepherd Sock in Blackberry. 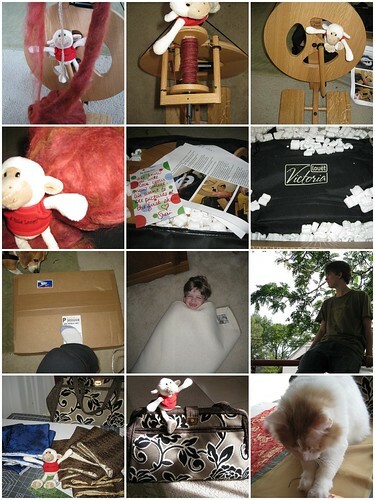 A few weeks back…I did a little (OK, A LOT) of destashing. (Selling collected yarn yummies, on-line.) 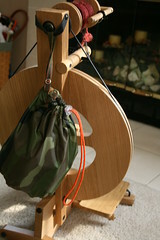 This was a dual purpose destash- to make money for a new mixer… and to replace the travel wheel I sold over Christmas. Louet came out with a folding wheel that looked about perfect. The Victoria. I contacted my most very favorite on-line retailer- Sheri- at The Loopy Ewe to see when she’d be getting wheels in… because I wanted to wait and purchase from her…. Sheri let me know- she “just so happened” to have ONE in the shop, that hand’t ever been used. I told her if Loopy (the shop mascot) would put his little hooves on it– I’d love to take it! A couple of days later- along with my ship confirmation- I recieved this pic> via e-mail. My wheel arrived quickly and well packed. I was thrilled that the Loopy Ewe’s “frequent shopper benefits” program applies to wheel purchases. This made the bottom line price (after subtracting what I’d earned in credits) the best by far for a Victoria. (Available in: oak (I have oak) and beech finishes/ wood choices. The wheel is solid and spins beautifully. It’s easy and fast to take down and put together. Last week- I took the wheel on a camping vacation with me- and it was PERFECT. I spun campside- and it was a dream to use. I just slipped a camper rug under the treadles to protect it a bit:) Even on the slightly uneven surface- The Victoria spun like a dream…. I also have a Majacraft Rose- a beautiful wheel but not really as “travel” friendly as I’d hoped. The Majacraft spins a bit smoother, which is to be expected, as it is considerably heavier and not foldable like the Victoria. My previous travel wheel was an Ashford Joy- which I loved. I think this one spins a bit smoother. Both are excellent travel wheels- and I highly recommend either one. The bottom line? You cannot beat the purchase experience at The Loopy Ewe! Wheels will be arriving at the Ewe shortly–(watch Sheri’s blog and the shop for news) I highly suggest saving up (or destashing) for YOUR new wheel asap! I know that large $ online purchases can be scary- but you can most assuredly trust Sheri and Loopy! 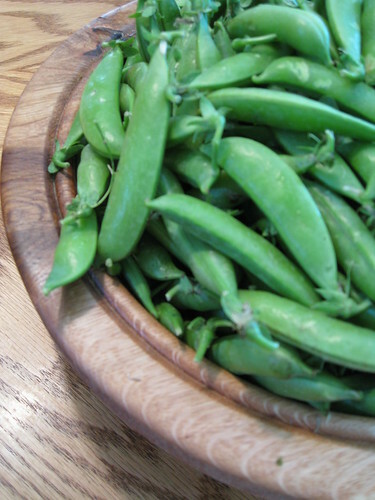 Sugar Snap Peas- locally grown and yummy as is… half a flat of them… and not a clue what to do with them! Today- I’ll clean and freeze them. The peas are photo’d in another farm market acquisition… a hand made white oak bowl made from a tree lost to the storms that hit earlier this summer. It was too pretty to pass by. The Farm Market on Sunday afternoons has quickly become a beloved family outing. This week- there were snap peas and the very last, of the best strawberries- I’ve ever tasted. The berries will be enjoyed in loads of recipes- the favorite of which is with just enough sugar to bring out the juice. Our adventure in slow eating has resulted in some interesting discoveries. 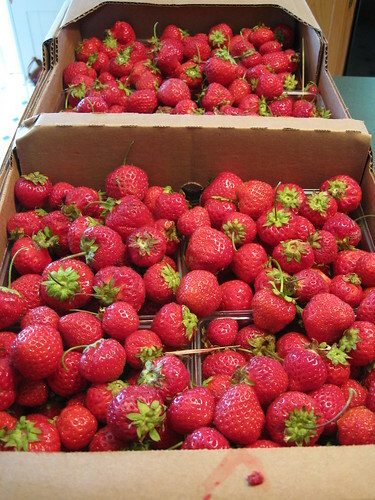 This week- while munching on berries- the oldest boy proclaimed them to actually taste like “strawberry flavoring”. That, is sad- as- the berries we typically get at the supermarket are reminiscent of berries— but lack the full flavor-they taste more like lightly strawberry flavored, sponge. By purchasing fruit out of season- and flown in from all over the world… we’ve been missing out on how good, it can really taste. I’ll be missing the fresh berries after this week… but will look forward to them all the more, next summer. 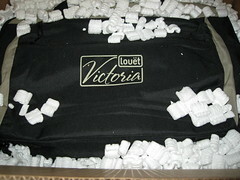 I’ll be posting a review of my new wheel tomorrow-A Louet Victoria- for travel- camping outdoor spinning and classes. 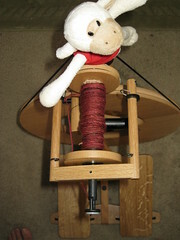 I was lucky enough to get the very first wheel sold from The Loopy Ewe. Sheri is amazing- and will “officially” start carrying wheels later this summer. 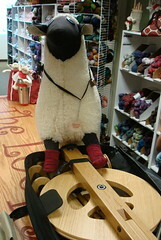 The Loopy Ewe’s Frequent buyer program even applies to wheel purchases! Besides her customer service cannot be beat. 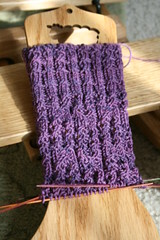 I can’t recommend The Loopy Ewe highly enough. If you are leary about online purchasing- and don’t have a local shop that can suit your needs- Go ahead- order from the Loopy Ewe- you won’t be disappointed. I am thrilled with both the wheel and the purchasing experience! I think, Noah is an alpaca. He seems to be in love. He spent most of the afternoon “humming” to alpaca’s. We went to the Ann Arbor Fiber Expo on Saturday. 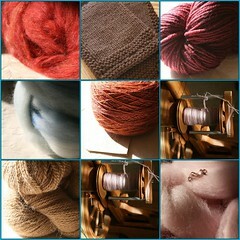 I picked up a few fibery goodies- including some BFL Roving— which nearly spins itself. Nice. There is also some alpaca yarn in a nice lt brown natural color. The center pic is Briar Rose Sea Pearl. Yum. Not pictured is Briar Rose Earth Song. The top center- is a new pair of slippers to be felted for Mr. I’m trying a new pattern- a bit simpler than the FT pattern- will review after felting. The Blue is handpaint BFL and Merino blend- earmarked for a special project. It’s from “Little Acres Farm” In Grayling Mi— sorry no website info on the bus card! 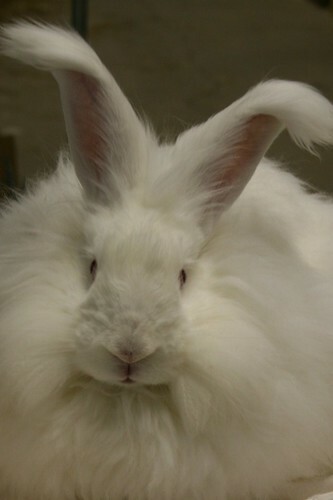 But this is wonderful roving! I seriously doubt the “association” would appreciate farm animals. Just sayin.